The distribution map of Rhododendron macrophyllum in southwest Washington State was updated with GPS (global positioning system) devices, inquiries to local residents, and new information gathered by volunteers about locations of native rhododendrons. The data was incorporated into a computerized geographic information system. Maps that accompany the article show the discrepancies between current distribution of Rhododendron macrophyllum compared to the historical maps published in 1978. A definitive comparison, however, will require more data on current distribution. A group of amateur botanists are collecting and organizing information about the natural distribution of some of our native rhododendrons. We have formed a standing committee of volunteers and Rhododendron Species Foundation staff that meets at the RSF headquarters in Federal Way, Wash. The project is called The Western North American Rhododendron Species Project (or WNARSP) and has its own budget, funding, mission statement and equipment. Efforts began with information from the private collection of project members and the files of the RSF. Review of these materials lead to the investigation of the development of a Geographical Information System, known as a G.I.S., which links a computer database with maps. Modern software and personal computers can utilize the space age technology of satellites to create precise and augmented maps that can be easily updated. The global positioning system (GPS) can be harnessed with inexpensive receivers that make field trips into rhododendron territory even more fun and productive. The project currently researches 13 species, sub-species and varieties, including the species formerly belonging to the genus Ledum and the controversial Therorhodion subgenus. The classification of the rhododendrons of Western North American has evolved since the inception of the project, and we are attempting to evolve along with it. The Revision of Rhododendron, subgenus Hymenanthes by D. F. Chamberlain inspired project members to investigate the true geographic distribution of Rhododendron macrophyllum (1). In this volume from the Notes of the Royal Botanic Garden, Dr. Chamberlain states that R. macrophyllum is a species of the "W coast of N. America" and more specifically, the "Western Seaboard of USA from the Canadian border to California". The range map for this North American native is in a volume of maps prepared by the Forest Service and Published by the United States Department of Agriculture (USDA) in 1976. Volume III of this Atlas compiled by E .L. Little, Jr., states in the introductory pages that the maps are intended to show the native or wild distribution "exclusive of changes caused directly or indirectly by European man." However, where changes have occurred following European settlement, the distribution is intended to be before Columbus, or pre-Columbian"(3). Perhaps this is the reason that there seems to be discrepancies between the current distribution of R. macrophyllum and the range shown on what I will refer to as the "USDA range map: (see Fig. 1). Figure 1. The base layer in black is a scanned image of the USDA range map created in 1976 and referenced by the Revision of Rhododendron, published in 1982. Observations of Rhododendron macrophyllum with latitude and longitude are imported from the WNARS Project database. Project data is symbolized by a layer of pink stars and represents approximately 1,200 entries. WNARSP members set out to examine whether the discrepancies in the Wind River Area of Washington State could be reconciled. Then researchers could compare the present range with historical maps and information. We hoped to determine if the range is expanding or contracting, or if the discrepancies were due to inaccurate and incomplete plotting on paper maps some 25 years ago. 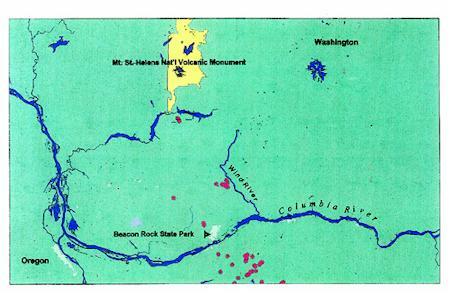 The Wind River area that we explored is in the southwest portion of Washington State, just north of the Columbia River that divides Washington from Oregon (see Fig. 2). While this area is far enough inland (almost 90 miles) that most residents would not consider it the coast or "seaboard," the northern Pacific coastal ecosystem usually includes all the land west of the crest of barrier mountains, in this case the Cascade Mountains. Figure 2. The Wind River Area of Washington State. Microsoft Pincarta, Virtual Globe, 1998 Edition, Copyright © 1988-1997, Microsoft Corporation. One common assumption shared by all the project members and most seed collectors was that Rhododendron macrophyllum did not grow east of the crest of these mountains, as the east side does not receive enough rainfall. Yet the USDA range map would lead one to believe that this species range laps over the crest, only slightly in Washington, but especially in Oregon (see Fig. 3, 4). 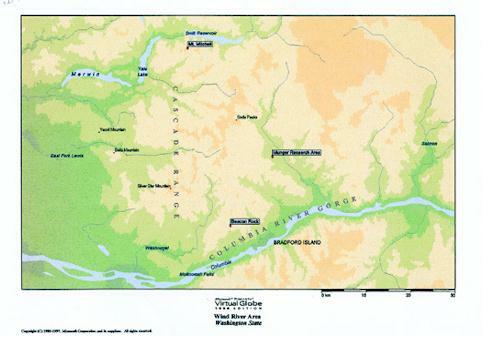 This range map shows the northern extent of the Washington concentration near the Columbia River about 10 to 15 miles from the Oregon border. North from this point, there was only one reported patch between the Wind River and the extensive lowland populations along the Puget Sound. Figure 3. The base map (black area) is a "zoomed" or close-up image of the 1976 USDA range map. WNARS Project data, represented by pink stars, are observations of Rhododendron macrophyllum reported to the Project. Beacon Rock State Park is shown with green for reference. Figure 4. Current sightings of R. macrophyllum are shown by pink stars without the USDA range map as background. We decided to concentrate on the southwest Washington population, to find out the most easterly and northerly extent and to map as accurately as possible the size of the groups that we encountered. Geographically isolated groups or outliers are specially interesting to many readers as they often represent the plants "on the edge" - plants that are succeeding in marginal (or unusual) growing conditions. Often collectors and researchers are searching for these groups as they may represent an unusual gene pool. The plants became established because of a microclimate, or they may have been introduced directly or indirectly by man. To find as many plant groups as possible, we knew that we had to enlist the help of local residents and professionals. We contacted the local Forest Service for any information they might have about survey plots that contain rhododendrons. The database of the Gifford Pinchot National Forest listed two entries in their computer search that provided us with section, township and range, creating a one-mile square search zone. We visited the Wind River Ranger station on three occasions and interviewed volunteer rangers who lived nearby. Yet despite a long association with the area, their knowledge of specific locations was seemingly outdated or possibly clouded with the passage of time. Our best source of leads turned out to be a local native plant devotee, Janet Lindgren, who responded to an article about the project that appeared in the January 1997 Journal American Rhododendron Society. Janet not only gave us solid leads but met us on two field adventures and has promised to continue the hunt and send in reports. We also consulted the State of Washington Department of Natural Resources, other local ranger station biologists and private timber company employees for tips on where to search and how to access the area. This associated information, directions for how to get vehicles to within walking distance, is often just as important as the putative address of our prey. 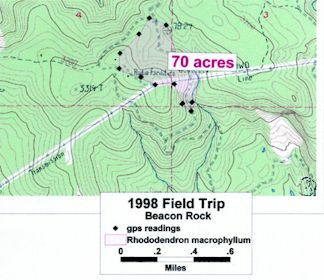 Armed with maps marked with recommended search sites, cameras and GPS receivers, field trips were conducted in June of 1997 and 1998. The first trip concentrated on the area around the Wind River ranger station where there were several reported plant groups accessible by car. Heavy rains hampered the search, but short hikes produced four areas containing rhododendrons. One group was large enough to justify a return for precise mapping in better weather. We also needed permission to enter the Thornton Munger Research area where a large overhead crane is operated. We were able to collect leaf samples and herbarium specimens for the RSF and researchers at the University of Washington. The second day was spent checking out roads that proved to be mostly washed out and impassable. The return in 1998 was actually two trips. In early June, a scout party checked on road access and mapped very small groups in the research area where access was limited. The next weekend was devoted to mapping new areas since the roads had been much improved. It was rewarding to find larger populations and see more flowers, as the weather was more cooperative-no rain. The trail up Mt. Mitchell is estimated to have 40 acres containing Rhododendron macrophyllum, and the flowers were typical pale pink. A second area, outside Beacon Rock State Park, contained approximately 50-70 acres of R. macrophyllum, chiefly on east or north facing slopes. We took photographs of a few flowers that were darker pink than average. It should be noted that this site seemed to have the greatest seedling germination of any that we had visited (see Fig. 5). Rhododendron macrophyllum blooms and regenerates most rapidly in forest clearings, which are naturally created in the forest by blow-downs or fire. Rhododendron macrophyllum sprouts well after fire or clear-cutting and many of our sightings are in areas recently logged. Have we been affecting the distribution of Washington's state flower with our forestry practices of discouraging fires and logging and replanting in monocrops of conifers? Many "remnant" groups of R. macrophyllum are near logging camp sites that were occupied many years ago by gypsy loggers. f they moved steam engines, living quarters and cook tents, perhaps they threw in a few shrubs to bring an encouraging touch of color to their new home. Figure 5. A topographical map shows a detailed area northwest of Beacon Rock State Park. Black squares represent GPS readings taken on field trip, June 1998. Area containing Rhododendron macrophyllum (shaded in pink) calculated at approximately 70 acres. We suspect that humans are affecting the range by collecting whole plants and relocating them to where they have little chance of survival. Although interviewees often say, "There's rhododendrons all over in the Wind River area," we found only a few locations after many man-hours of searching. We do not know if rhododendrons used to be more plentiful, or just more obvious when the forest was less mature. Rhododendron macrophyllum does not bloom well in the dense shade of mature conifers. Will the rhododendron return when the forest is cut? One of the largest groups of plants we found was in an area that had been cleared for radio and cell phone transmission towers. A large swath cut for power lines may be responsible for some of the plants marked on the map northwest of Beacon Rock State Park. Do we feel that we found all the Rhododendron macrophyllum in the area? We doubt it, as we found only about 120 acres of rhododendrons. We searched logging roads, resort areas and parts of the Pacific Crest Trail, all in an area of almost 200 square miles. We have received unsubstantiated reports of more pockets of R. macrophyllum north and west of the area that we explored near the Wind River, and even farther off the USDA range map. It is a goal of the project to collect these tips, conduct further field trips and attempt to fill in the gaps in our knowledge. Did we "correct" the USDA range map? 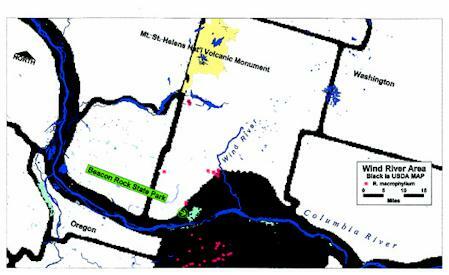 Analysis of the mapping indicates that the black area shown in southwest Washington can be partially rectified by a shift to the west. Since the maps were created with a scale of one inch equals about 158 miles, being too far east by 10 miles is well within the accuracy to be expected. We do feel that our mapped locations that are more than 21 miles to the north of the USDA lines are legitimate additions. They should have been represented by a dot, which covers about 10 miles, or an extension of the concentration. Our maps are made on a computer with software called Maptitude ® donated by Caliper Corporation, Newton, Mass. The scale of the maps generated by the computer are, of course, variable, and each map accompanying this article has a different one. We have also utilized MapTech software, supplied at cost by Maptech, Greenland, NH., to import digitized USGS topographical maps. The USDA range map is incorporated by using a scanner to digitize the paper map. It appears as the base layer, and area landmarks, roads and place names are added to other layers for reference. All location and other data about the rhododendrons are entered into an ACCESS ® database, with software donated by the Microsoft Corp., Redmond, Wash. The database has been customized and enhanced by Sumner Software Technology. The ARS grant funded a student intern working at the RSF for more than 320 hours of keyboard entry, calculations and filing. She was able to organize and locate entries for over 1,300 Rhododendron macrophyllum locations, and another 1,000 entries for the other 12 rhododendron subjects. When the database files are linked with the mapping software, we not only create a image that can be manipulated into a map, but we get a instant visual check on our work. Every "typo" or error in entering the location values shows up and enables mappers to catch errors that regular proofreading of tabular data can miss. Locations reported by Forest Service records are pin mapped at the center of the section. Locations based on reports from volunteers observers that are not equipped with GPS receivers are scaled from maps, or located using other mapping software, and often have very detailed directions. There is considerable data about some sites not shown in the maps accompanying the article because of space limitations. Maps are not routinely printed on paper for viewing, but are specially prepared for the circumstance. The WNARSP database is designed to hold directions and right of entry information that will help those who follow in the footsteps of the observer, when possible. For although our maps add an update to the historical record of where our native rhododendrons can be found, there are other applications for our maps. Collectors of seed or plant material need an up-to-date map with accurate reports of observations, but they also need the associated data. We attempted to gather not only a latitude and longitude of the distribution of the species, but elevations, logging road numbers and the most likely route for an approach. It is our hope that we can provide a complete "package" for researchers and interested hobbyists. Maps of Western North America are being prepared for the upcoming symposium and convention to be held in Bellevue, Wash., in the spring of 1999. There is much work to be done in entering the information into the database so that maps will be as complete as possible. Maps are easily updated when new observations have a longitude and latitude, but there is a backlog of incomplete observations that need the reported location scaled from maps. The database also has links to images such as digitized images of flowers, and we need help to collect and store slides, photos and links to seed collections. It is our goal to be accessible via the World Wide Web, and there is a short page of information available on the RSF web site. We encourage and appreciate communications from local ARS chapters and individuals who are able to contribute to our quest for the complete range maps of all native western rhododendrons. Report forms are available through the RSF office and we welcome inquiries about maps for field trips in your area of the western United States. Please address all WNARSP correspondence in care of our RSF staff liaison: Richard Peterson, P.O. Box 3798, Federal Way, WA 98063. The WNARSP committee wishes to acknowledge the Research Foundation of the ARS for funding that enabled the Project, via the Rhododendron Species Foundation, to hire an intern for data entry. We wish to thank the RSF staff and volunteer librarians for their cooperation and flexibility, which allowed the committee volunteers and our intern, Becky Reimer, to work in the Lawrence Pierce Library. GPS equipment, custom computer programming and additional software has been purchased with grant funds from the Helen G. Walker Charitable Trust. Many individuals and the International Rhododendron Union contributed funds or equipment. We wish to thank the employees of the National Forest Service, the National Parks Service, the Washington State Department of Natural Resources and numerous herbaria that responded to our requests for information and gave us leads and suggestions. University researchers and fellow amateur plant hunters have sent us their collection locations. We have also benefited from unbilled hours of time donated by Sumner Software Technology. 1. Chamberlain, D. F. A Revision of Rhododendron II. Subgenus Hymenanthes. Notes RBG Edinb. 39(2):317; 1982. 2. Little, E. L., Jr. Atlas of United States Trees. Vol. I, USDA Misc. Publication No. 1146, 1-8; 1971. 3. Little, E. L., Jr. Atlas of United States Trees, Vol. III, USDA Misc. Publication No. 1314, 1-10, Map 152; 1976. 4. Pojar, J.; MacKinnon, A. Plants of the Pacific Northwest Coast, Redmond, WA: Lone Pine Publishing, 1994.